One way that sensors can track your position without using an array of satellites is by measuring your acceleration as you move around -- but unless you're piloting a jumbo jet, current devices aren't very accurate. 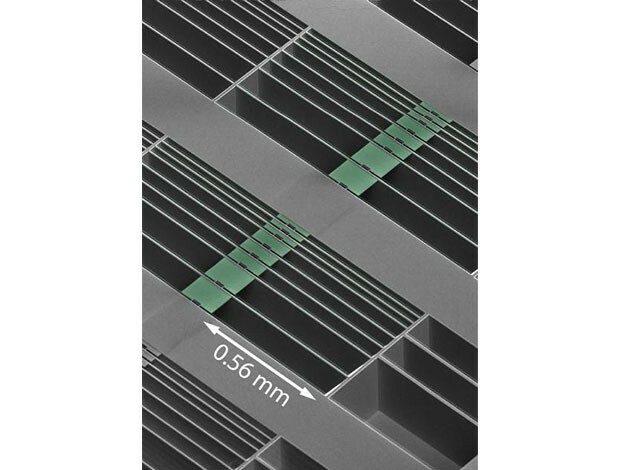 Researchers at Caltech hope to change all that with a new, ultra-sensitive accelerometer they developed, which uses laser light to detect motion changes. The scientists managed to shrink a so-called large-scale interferometer down to micro-scale sizes, creating a device "thousands of times faster than the most sensitive sensors used today." That could allow a smartphone with such a micro-sensor to detect your exact position even while inside a grocery store, and flash "ads and coupons for hot dog buns" while you're in the bread aisle, according to Caltech. All that sounds good, but we can perhaps think of more inspiring uses for the new tech. Caltech laser accelerometer research may bring fine-tuned position tracking, grocery ads originally appeared on Engadget on Fri, 19 Oct 2012 13:44:00 EDT. Please see our terms for use of feeds. Last time we checked in with the 3D printing upstarts over at Formlabs, their Kickstarter was doing splendidly, having over doubled its initial funding target. Well, less than a month later, and with the money still rolling in, the current total stands (at time of writing) at a somewhat impressive $2,182,031 -- over 20 times its initial goal. When we heard that the team behind it, along with some all important working printers, rolled into town, how could we resist taking the opportunity to catch up? The venue? London's 3D print show. Where, amongst all the printed bracelets and figurines, the FORM 1 stood out like a sore thumb. A wonderfully orange, and geometrically formed one at that. We elbowed our way through the permanent four-deep crowd at their booth to take a closer look, and as the show is running for another two days, you can too if you're in town. Or you could just click past the break for more. 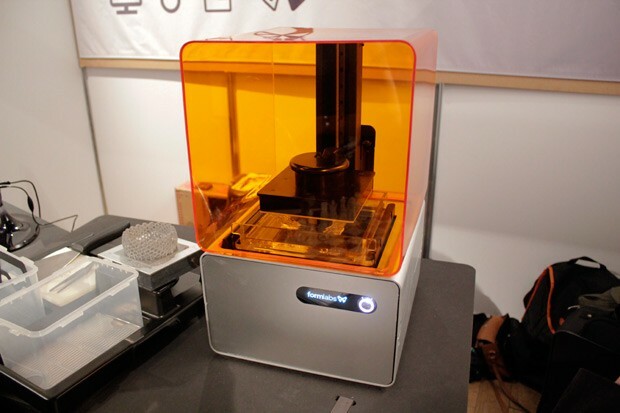 Formlabs FORM 1 high-resolution 3D printer spotted in the wild, we go eyes on (video) originally appeared on Engadget on Fri, 19 Oct 2012 15:00:00 EDT. Please see our terms for use of feeds. Android: Swype, one of your favorite Android keyboards (and one of ours too), just rolled out an update for beta users packed with useful features, like the ability to sync your dictionary across Android devices, tablet-friendly layouts, and more. 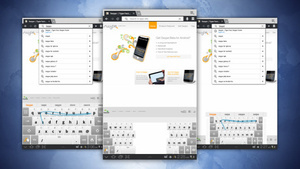 Swype users who have been waiting for a tablet-friendly layout for the app have several to choose from. The new "hotwords" feature solves the problem of typing words that are trending in common language and social media that may not be in a dictionary yet. The feature is opt-in, and if you do participate, your dictionary will periodically get updates with new words based on what people are discussing online, from "gangnam style" to "stratos." The latest version of the Swype Beta is still free, and available at the link below. Well, this has got us scratching our collective heads. 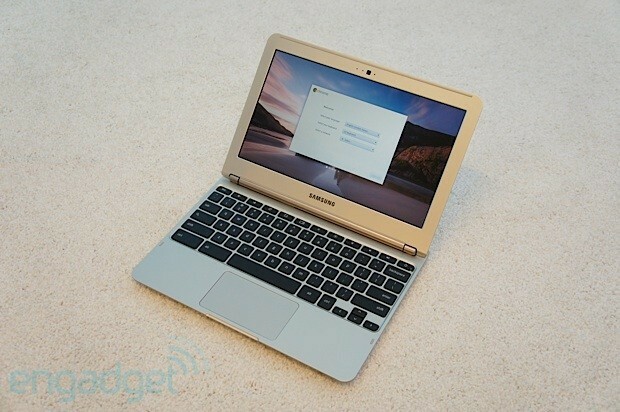 Yesterday, Samsung was fairly certain that its latest and greatest Chromebook would be a WiFi-only affair. Today, however, and a listing has appeared on the company's official website and Amazon that shows a 3G-enabled option is available for $329.99. Neither site mentions network options, so presumably you get the same 100MB a month for two years Verizon data that its brethren receive -- and given that we described it as being "80 percent of the MacBook Air experience for a quarter of the price," the 3G version seems well worth the extra $80. Listing reveals 3G Samsung Chromebook is on its way for $329.99 originally appeared on Engadget on Fri, 19 Oct 2012 03:37:00 EDT. Please see our terms for use of feeds. Its no Droid RAZR Maxx HD, but Kyocera's Dingo S just might be the trick longevity lovers in the land of the rising sun are looking for. This 4.7-inch Android 4.0 handset's 2,520mAh battery claims to have the largest capacity of any sub 5-inch device in Japan, promising more than 18 hours of talk time, and between 580 (3G) and 720 (LTE) hours on standby. If that isn't quite enough power for you, you won't have to wait long for a recharge: Kyocera says the Dingo S can go from 0 to 50 percent in only half an hour. No word yet on price and availability, but the 1.5GHz dual-core device will be available through KDDI in white, pink and blue at launch. Check out Kyocera's official press release after the break. Kyocera announces Dingo S smartphone for Japan, promises over 18 hours of talk time in three colors originally appeared on Engadget on Fri, 19 Oct 2012 05:23:00 EDT. Please see our terms for use of feeds. 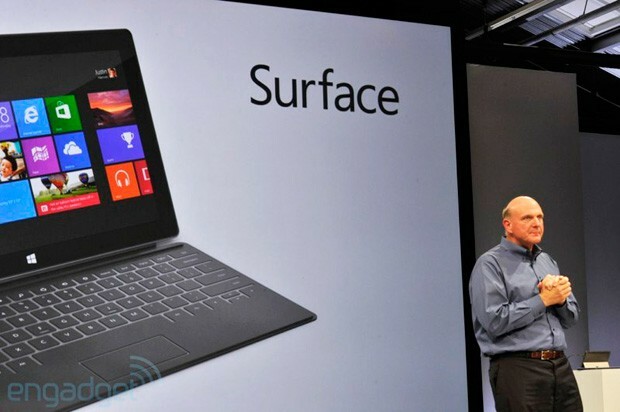 Microsoft announces Q1 earnings with $5.31 billion in profit, braces for Windows 8 surge originally appeared on Engadget on Thu, 18 Oct 2012 16:06:00 EDT. Please see our terms for use of feeds. Apple has recently released a Mac update for OS X Lion and Mountain Lion that removes its Java plugin from all OS X browsers. If you install the update, you'll find a region labeled "Missing plug-in" in place of a Java applet; of course, Apple can't stop you from clicking on it to download a Java plug-in directly from Oracle. The Cupertino-based company had previously halted pre-installing Java in OS X partially due to the exploitable factors of the platform, so this update signifies further distancing from Larry Ellison's pride and joy. Apple says no Java for you, removes plugin from browsers on OS X 10.7 and up originally appeared on Engadget on Thu, 18 Oct 2012 19:34:00 EDT. Please see our terms for use of feeds. An Ubuntu release is always a momentous occasion for a large portion of the Linux community, although it's coming with a mild share of controversy this time around. Ubuntu 12.10 (Quantal Quetzal) is finished and brings with it support for pinning web apps to the Launcher as well as search that includes web results, detailed photo results and quick previews. They're all appreciated upgrades -- what's raising hackles is the development strategy for 13.04, or Raring Ringtail. Company head Mark Shuttleworth wants a "skunkworks" approach that will silence pre-release discussion of some features outside of key, trustworthy community members. While there will still be open-source code and only a light layer of secrecy, Ubuntu's progress in the near-term won't be quite as transparent as we're accustomed to with Linux. There's a good chance that most end users won't mind the difference enough to skip the download. 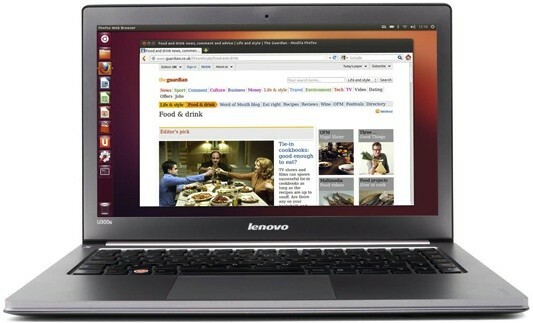 Ubuntu 12.10 launches with web apps and search, Canonical plans for more secretive 13.04 development originally appeared on Engadget on Thu, 18 Oct 2012 20:38:00 EDT. Please see our terms for use of feeds. Every TV maker trying to avoid total commoditization has a special trick to keep its designs unique and worth a higher price. For JVC, that trick is sound. It's launching the BlackSapphire line of LCD-based 3D TVs with the 55-inch, edge LED-lit JLE55SP4400, whose signature is an unusually powerful built-in audio system: the 45W system and 3D processing supposedly produces surround sound without having to line the living room with extra speakers. Odds are that the set won't provide much competition for dedicated speakers, although JVC is promising more integration beyond this with rare built-in SlingPlayer TV streaming, just in case there's a Slingbox in another part of the home. The all-in strategy could make the inaugural BlackSapphire more of a bargain than it looks: that $1,300 you'll pay when the screen ships this month might be all you need to start watching. 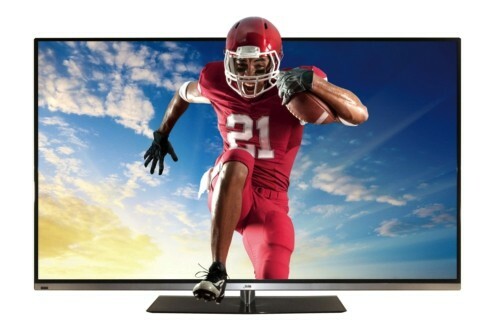 JVC intros 55-inch BlackSapphire ! LCD TV w ith 45W virtual surround sound, SlingPlayer originally appeared on Engadget on Thu, 18 Oct 2012 12:47:00 EDT. Please see our terms for use of feeds. If you're itching to park that AMD or Intel PC beside your TV as a dedicated home theater device, OpenELEC would like to offer up the first stable release of its Linux distro, version 2.0, for your consideration. The new build is now available for free (with the option to donate, of course), and the group behind it says that the installation takes less than five minutes and requires "zero Linux experience." Once you've done that, it'll be ready to serve your media needs in less than 10 seconds from a cold start, according to OpenELEC, with only a remote control needed to start surfing. The system updates automatically, including the XBMC V11 media core, and now includes PVR support, improved AMD functionality, CEC adapter compatibility, NFS, AFP, CIFS and SSH shares and Airplay / Airtunes support. If you're already Mac- or Windows-centric, an OpenELEC system will play well with all your existing media, so if you're ready to see how the Linux media crowd rolls, hit the source. 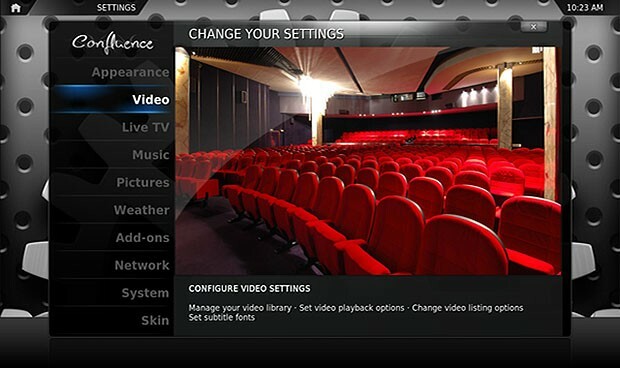 OpenELEC-2.0 Linux distro released, turns your PC into an 'appliance-like' home theater device originally appeared on Engadget on Thu, 18 Oct 2012 07:26:00 EDT. Please see our terms for use of feeds. Acer hasn't had an easy mid-year: it trotted out the Iconia Tab A110 at Computex as a budget Android tablet that could still claim Tegra 3 speeds, only to watch the Nexus 7 arrive and leave virtually every other comparable tablet in a tight spot. It's North America's turn at the A110 this month, and the side-by-side looks aren't getting much easier. When the 7-inch Jelly Bean slate ships to the continent on October 30th, it will cost $230 in both the US and Canada for the lone 8GB version -- a better value than we see in Europe, but still a slightly awkward middle ground between an 8GB Nexus 7 at $199 and its $249, 16GB edition. We're guessing that Acer is counting on the microSD and micro-HDMI expansion to tempt would-be North American buyers away from a less flexible (if Google-blessed) rival. Acer Iconia Tab A110 reaches North America on October 30th for $230, faces a tough fight originally appeared on Engadget on Thu, 18 Oct 2012 08:00:00 EDT. Please see our terms for use of feeds. The arrival of Windows 8 is a good excuse for the PC industry to flood the market with so much hardware, consumers will be blinded by so much choice. Acer's jabbing its digits into your eyes with its new lineup of low-end desktops for the casual user. The ME micro towers will take an Intel Core i5 or I7, 2TB HDDs and up to 16GB of RAM. If you don't have anywhere else to stash your smartphone, the chassis comes with a recess desk on top with a USB port for easy charging. Those looking for something a little less demanding can pick up an XC desktop, a space-saving unit that will take an Intel Core i3, a 1TB HDD and up to 6GB of RAM. Prices for the ME begin at $700, while the cheaper XCs will set you back a much more modest $400. 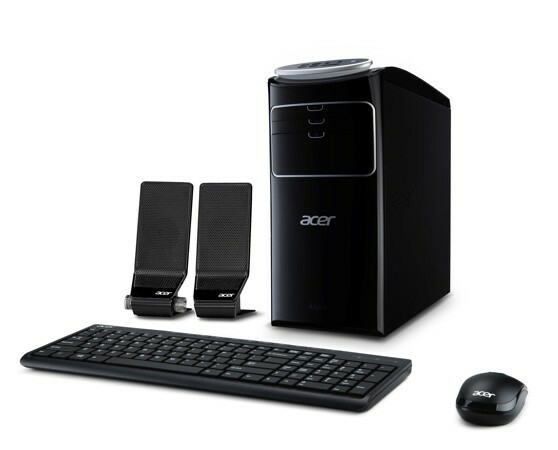 Acer unveils space-saving ME mini tower and XC desktops for (low) power users originally appeared on Engadget on Thu, 18 Oct 2012 08:00:00 EDT. Please see our terms for use of feeds. Sony's NEX-7 may be fast approaching its first birthday, but that doesn't mean the company's ready to give up on pushing out updates. The camera's first new firmware version, 1.01, should be hitting today, bringing with it the ability to disable the Movie Record button to avoid accidental taps (finally! ), boosted image quality with a wide-angle lens, improved audio playback and expanded EV bracketing. An option to disable the EVF eye sensor doesn't appear to be included with this revision, unfortunately. Other updates hitting at the same time include E-mount lens firmware v.01 that'll enable NEX-5R/NEX-6 Hybrid AF functionality with older lenses, A65/A77 firmware v1.06 and A37/A57 firmware v1.03, both of which deliver the ability to enable/disable the movie record button while also adding a variety of lens compensation options for select Alpha optics. All of these updates should now be live -- head over to the source link below for the hook-up. 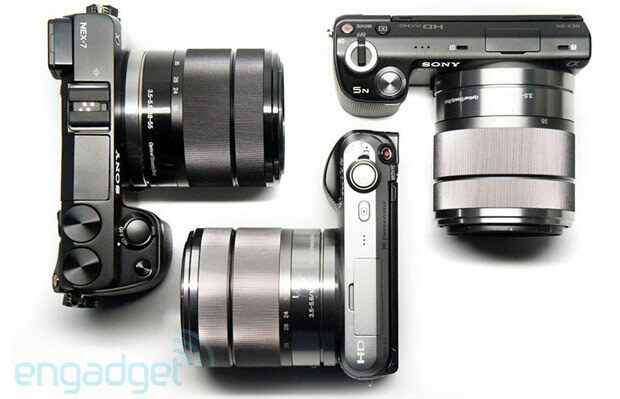 Sony Alpha firmware updates bring record button disabling on NEX-7, DSLR lens improvements originally appeared on Engadget on Thu, 18 Oct 2012 00:00:00 EDT. Please see our terms for use of feeds. Itching for Nokia's latest piece of Windows Phone kit, but aren't ready to saddle up with Ma Bell? Get comfortable: according to a leaked AT&T training video, you'll have to wait six months for the Lumia 920's exclusivity contract to expire. 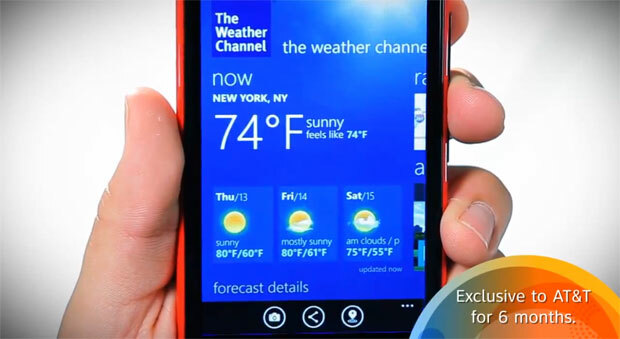 The unofficial Windows Phone 8 flagship is due out next month, though mum's still the word on its actual ship date. The trio of videos also give AT&T employees a brief run down of Nokia City Lens, wireless charging and the handset's NFC features. If you simply can't wait until spring, Verizon and T-Mobile are serving up a pair of mid-range alternatives, the Lumia 820 and 822, respectively. Otherwise, head past the break to see the videos for yourself and test your patience. Leaked training videos peg Lumia 920 as AT&T exclusive for six months, shows off City Lens, wireless charging originally appeared on Engadget on Thu, 18 Oct 2012 01:17:00 EDT. Please see our terms for use of feeds. Razer has been big on Star Wars gaming gear, but never quite like this. Enter a free contest and there's a chance to win a completely unique Star Wars: The Old Republic version of Razer's Blade gaming laptop. 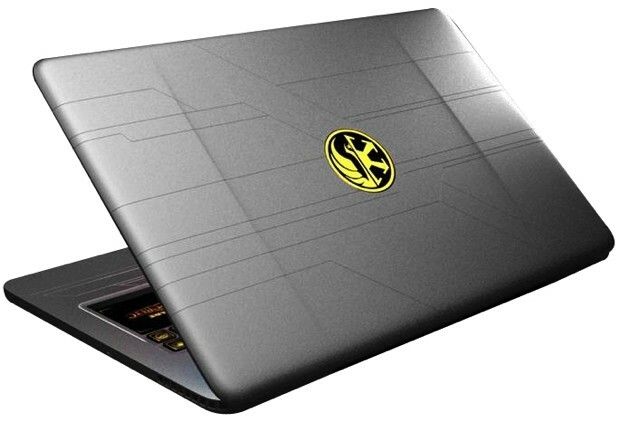 The winner sees the system's normally black shell replaced with a matte, laser-etched aluminum gray and the green backlighting dropped in favor of a subtler yellow matched to the MMORPG logo. Anyone who brings out this portable at a bring-your-own-computer gaming party is inevitably going to be the center of attention, although we have a feeling some would almost prefer the second-place bundle of peripherals -- at an estimated worth of $15,000, the Star Wars Blade might be too precious to carry for all but the most well-heeled of fans. Razer gives away custom Star Wars-themed Blade, may turn friends Imperial Guard red with envy originally appeared on Engadget on Thu, 18 Oct 2012 03:21:00 EDT. Please see our terms for use of feeds. 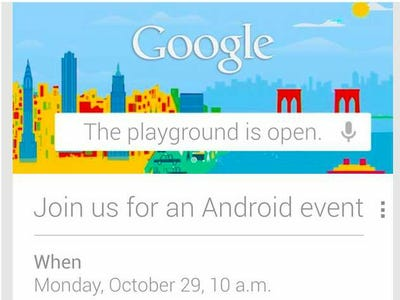 Google just sent out invites to the press for an Android-themed event in New York. The announcement will likely be for Google's new Nexus phone, which is rumored to be made by LG. It's also possible Google will team up with other hardware manufacturers to make Nexus devices this year. The LG Nexus is said to be a variant of the LG Optimus G, which recently launched. Finally, there are rumors Google will offer a new Nexus 7 model with 32 GB. The entry-level 16 GB Nexus 7 could also drop to $99 from $199. Android Boss Andy Rubin is also scheduled to speak at AllThingsD's mobile conference following Google's press conference. We're guessing he'll use that opportunity to show off the new Android hardware. Even more interesting, Microsoft is holding a press conference the same day to announce the final consumer-facing features for its next mobile operating system Windows Phone 8. Researchers at Stanford claim they've figured out how to erase the traumatic memories of mice while they sleep bringing them one step closer to their goal of ending PTSD for humans. Apparently a prescription memory-eraser could even be on the way. Are we closer to an Eternal Sunshine moment than we think? The conventional treatment for stress and anxiety caused by traumatic events can be grueling for the patient, barbaric, even. They've simply got to recall the drama over and over and over in front of a shrink until, eventually, they learn how to deal with it—and there's no guarantee the patent won't relapse. Nature reports the research of a Stanford team that found a way to replicate this therapy passively in sleeping mice. First, the researchers trained mice to fear the smell of jasmine by exposing them to the smell and then zapping them electricity. Once the mice were thoroughly traumatized, the researchers went about un-traumatizing the mice in their sleep. One batch of mice received traditional therapy: They were exposed to the smell while they slept without getting shocked, and eventually got over the fear—temporarily at least. 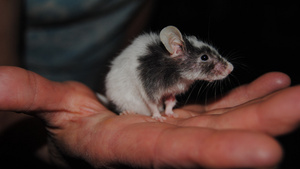 These mice, like PTSD humans tended to relapse. In other mice, Rolls administered a drug to block protein production in the basolateral amygdala - a brain area associated with storage of fearful memories - just before the animals went to sleep. The researchers then exposed the sleeping mice to repeated odor puffs alone. Upon waking, these animals showed reduced fear responses to amyl acetate [the smell chemical] that carried over even into new environments. 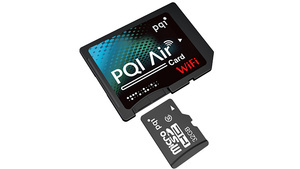 Unlike the Eye-Fi wireless SD cards which lock you into a set amount of storage, PQI's Air Card uses a microSD slot so that as the tiny cards get bigger and bigger, you can easily upgrade the adapter's capacity. "Taking one's sweet time" just took on an entirely new meaning. 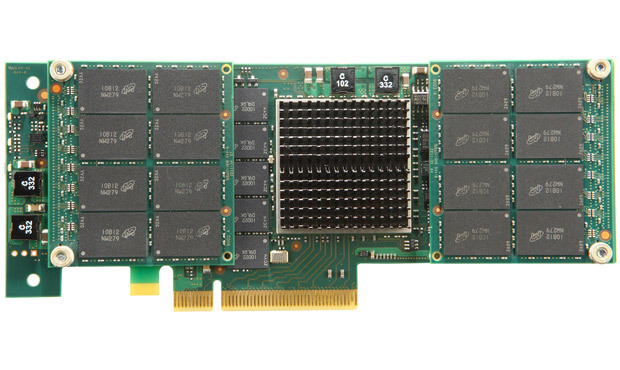 Well over a year after Micron first introduced its RealSSD P320h PCI Express SSD, the aforesaid device is finally hitting the general availability stage. And with that, the flood of reviews begins. What sets this guy apart right out of the box is its native stature; much like Fusion-io (and very unlike most all other rivals from OCZ, Intel, LSI, etc. ), this thing sidesteps the mishmash of SATA / SAS controllers and opts for a direct-attached PCIe approach. At around $7,000, it's clearly aimed first at enterprise, but given Micron's history in the consumer space, one could assume that this kind of wizardry will eventually trickle down. The fine folks over at HotHardware found their tester to be shockingly quick, easily outpacing its rivals when it came to read and write performance. Unfortunately, the Windows drivers provided weren't exactly mature, which led to a few booting issues when swapping in varying motherboards. Of course, no one ever said the Ferrari of PCIe SSDs would purr without a bit of finagling. Hit up the links below for the full spiel. Micron's RealSSD P320h PCI Express SSD gets reviewed: wildly fast, but a little unstable originally appeared on Engadget on Wed, 17 Oct 2012 15:49:00 EDT. Please see our terms for use of feeds. Not to be outdone by Korean rival Samsung, Toshiba has become the latest manufacturer to announce it's now accepting pre-orders for its loaded repertoire of Windows 8 PCs. Naturally, this contains an array of options for all different types of budgets and preferences, including the Japanese company's Satellite S, P and L laptops or the U series of Ultrabooks, the Qosmio X875 for gamers and, for those who enjoy a more desktop-friendly setup, the LX815 and LX835 all-in-ones are also there for the taking. As expected, Toshiba will be shipping online pre-orders on October 26th, while folks who decide to go the brick-and-mortar route should be able to physically pick one up on that very same day. There's still a lot more where this came from, but you'll have to head over to Toshiba's site to see what else the outfit has to offer -- link to the store is just down below. Toshiba kicks off pre-orders for Windows 8 PCs, all due to ship October 26th originally appeared on Engadget on Wed, 17 Oct 2012 17:24:00 EDT. Please see our terms for use of feeds. If you own a 55-inch 3DTV, chances are you've invested in at least a cheap soundbar to match the power of the picture on the screen. You basically have to; the built-in sound on most sets is horrendous. The sound system in the new 55-inch JVC BlackSapphire 3DTV is way burlier than the sound in comparable TVs, and from what we just heard in a hotel room in New York, it may be good enough not to need a soundbar boost. The TV has a built-in 45-watt, 2.1 channel sound system, which can mimic surround sound using proprietary JVC processing. 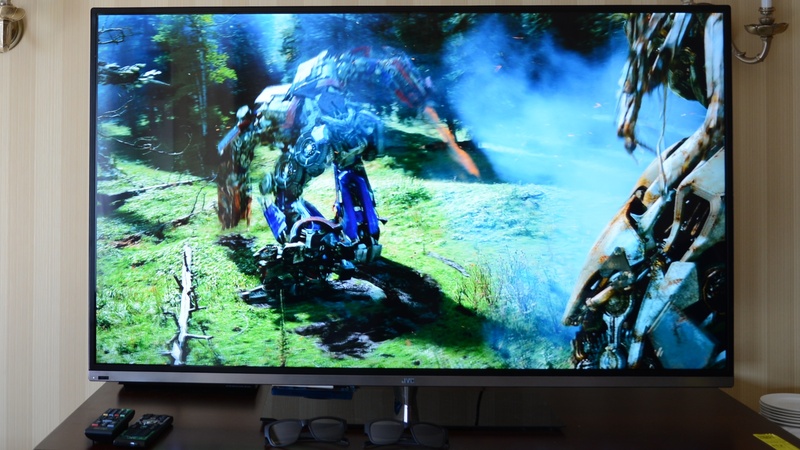 (The TV is actually made by a OEM called AVC, which is using the JVC name under license.) 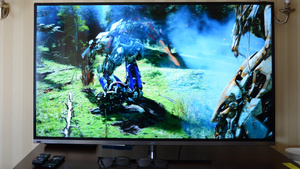 Consider that most other 55-inch TVs have 18-20-watt systems. I can confirm that it's loud; at just 50-percent volume the action from a scene in Transformers was enough drown out anything else in the room. But more than the wattage, the overall sound was clearly an improvement over your standard set. For example, you could make out dialog from background ambiance. There was even some totally passable bass coming from the 4.5-inch subwoofer. Spinning helicopter blades that sound realistic straight from an 3DTV is actually incredible given the sorry state of the sound from flatscreens. The effect isn't earth-shattering, but for people squeezing big the big TV into a medium-sized room it's probably enough.